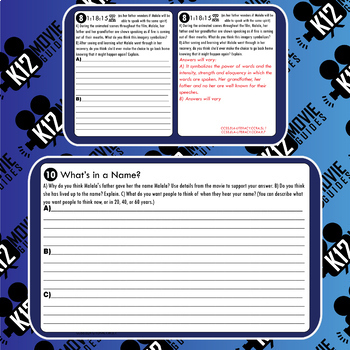 He Named Me Malala Movie Guide | Questions | Worksheet (PG13 - 2015) challenges students to analyze the life and work of Malala Yousafzai. Explore how the Taliban slowly took over her home town, oppressed her people and outlawed females going to school. Ask students to connect with Malala's life by comparing their situation to hers. Discuss what how Malala and her father valued education and how their community values educations. Finally think critically about what Malala's name means and what students want people to think of when others hear their name. Check the preview file for high resolution sample questions to see if this movie guide is suitable for your students. This resource consists of 10 high-level, short answer reflection and essay questions that will do more than just ask your students to regurgitate information. 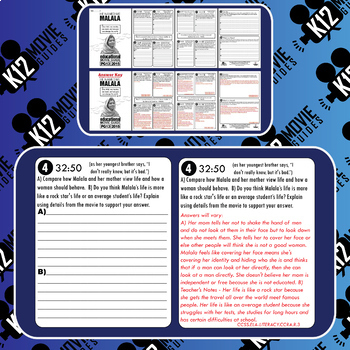 An answer key (4 pages) IS included with this movie guide, however many answers will vary as students are encouraged to construct their own meaning from the characters' dialogue and behavior.